55-year-old Roger Crouch become a strong advocate against anti-gay bullying after his 15-year-old son, Dominic, tragically ended his life last year after jumped from a building near his school in Gloucestershire, UK, and last November 3 was given the Hero of the Year award by the UK’s Stonewall organization. 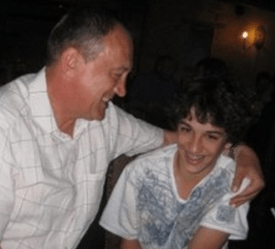 Less than a month later after leaving a final farewell message to friends and family on Facebook that read “Au Revoir, so long – or maybe A Bientot”“, Roger Crouch still grief stricken over the senseles loss of his son committed suicide by hanging. Roger’s wife in a statement she read to the court at her husbands inquest stated that Roger had continued to suffer mood swings and bouts of depression over Dominic’s death. “There was a lot of death in his life,” she said. Recording his verdict at Gloucester Coroner’s Court, assistant coroner David Dooley said: “Clearly he was very taken up with campaigning for his son and others he felt may have been subjected to bullying. God that is such a double tragedy. So sad.